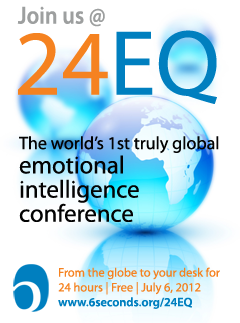 It’s shaping up to be the biggest event in the history of EQ — now over 3000 registrations for this amazing marathon of free webinars from top experts. Accessible worldwide, anyone with internet is invited to join and learn about the powerful science and practice of emotional intelligence starting July 6 at 00 Universal Time (that’s 5pm in California on July 5). Learn more and register now! And many more truly outstanding experts from Asia, Europe, Latin America, the Middle East… it’s a global wave of EQ — coming to your desk. There’s no charge to attend — but registration is required and some sessions are close to being full — so click here for details and to register!